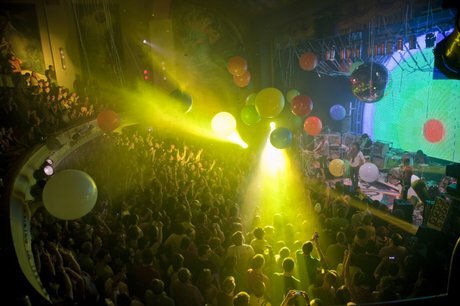 Standing in Liberty Hall during a sold-out Flaming Lips concert was like being inside a kaleidoscope. In fact, the overwhelming number of balloons, confetti and streamers made things a little claustrophobic. The Oklahoma City rock band brought so much firepower to its two-night stand in Lawrence that the show opened with a disclaimer from frontman Wayne Coyne: Don’t stare at the strobe lights, and be cool when the space bubble rolls out. The famous inflated see-through orb that Coyne inhabits and then rolls over the outstretched hands of the crowd came out during a cover of Pink Floyd’s “On the Run.” As Coyne rolled over the masses, it looked like he could have easily hopped into the balcony. With a capacity of 1,200 people, the building seemed like a bandbox compared to the acres of festival grounds the Lips usually have to play in during summer festival seasons. A massive mirror ball hung so low over the stage it seemed like Coyne might be able to touch it. Late in the set he donned giant hands that shot lasers and pointed them at the ball, spraying light across the room.A giant LED screen filled the back of the stage and troupes of dancers dressed like Dorothy Gales buttressed the wings. Fans got their chance to sing early. Favorites “Race for the Prize,” “The Yeah Yeah Yeah Song,” “She Don’t Use Jelly” and the slow campfire arrangement of “Yoshimi Battles the Pink Robots (Part One)” all came out in the first half of the set. The second half displayed newer, more experimental material. It wasn’t as bubbly, but fans ate it up just the same. The show was part of the 100th annniversary party for Liberty Hall. Seventh Street was blocked off south of the venue, between Massachusetts and New Hampshire streets. Vendors sold everything from beer and BBQ to T-shirts and cake. Families lined up around the bounce castle while groups performed on the stage at the other end of the block. A screen at the back of the stage broadcast a live feed of Lips show. Setlist: Race for the Prize, She Don’t Use Jelly, The Yeah Yeah Yeah Song (With All Your Power), On the Run (Pink Floyd cover), Worm Mountain, Yoshimi Battles the Pink Robots (Part One), Sea of Leaves, Drug Chant, The Ego’s Last Stand, What Is the Light?, The Observer. Encores: Going Up the Country, 21st Century Schizoid Man, Do You Realize? Every Christmas Eve, a significant block of time is set aside to honor the late Joe Strummer, who died on Dec. 22, 2002. This year, The Daily Record celebrates Strummer’s lifelong love of reggae music. In the early days of the London punk scene, DJ/filmmaker/musician Don Letts played reggae albums at the famed Roxy Club. At first the reggae was a necessity – the punk scene was still too young for any of the bands to record their own material. But even after the punk catalog exploded, the reggae remained. “The punks were digging on the old anti-establishment chant down Babylon (attitude), heavy bass lines and they didn’t mind the weed,” Letts told Mojo magazine in 2008. Not that this was many of the punks’ first exposure to the Jamaican genres. “People like (Joe) Strummer, (John) Lydon and (Paul) Simonon didn’t need Don Letts to turn them on,” Letts said in the same interview. 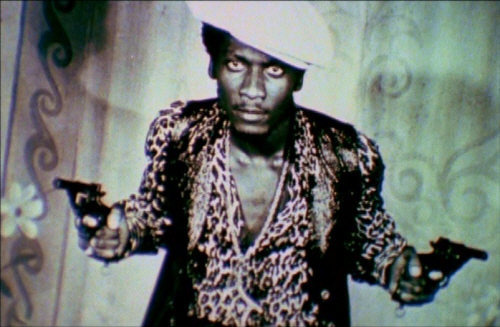 Jimmy Cliff in "The Harder They Come." 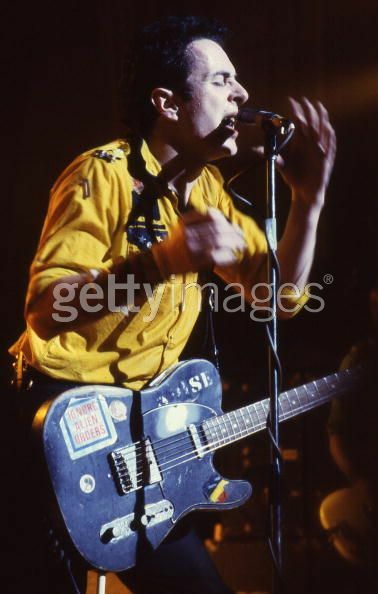 Strummer, Simonon and the remaining members of the Clash likely stumbled upon Toots and the Maytalls’ “Pressure Drop” shortly after its 1972 release on the soundtrack to “The Harder They Come.” Both the film and the soundtrack had a profound influence on Strummer. In 1977 the band covered “Pressure Drop,” which was released in 1979 as the b-side to “English Civil War.” The title of their second album, “Give ‘Em Enough Rope” borrows the style of “The Harder They Come” by introducing a well-known phrase and letting the second half remain implied (i.e. “… and they’ll hang themselves”). Two decades after the release of “Rude Boy,” Strummer recorded his own version of “The Harder They Come.” Teaming with the Long Beach Dub All-Stars and U.K. reggae singer Tippa Irie, his cover was released on the 2000 benefit album “Free the West Memphis Three.” Strummer’s interpretation doesn’t alter much from Jimmy Cliff’s original, but he’s clearly having a great time. 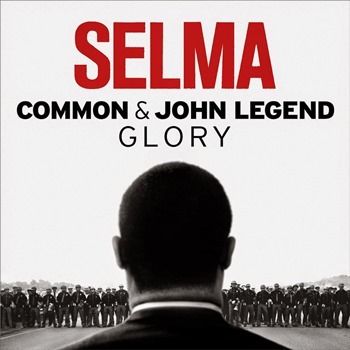 Strummer thought enough of the song that another recording of the song was posthumously released the b-side to “Coma Girl.” Recorded live with the Strummer’s final band, the Mescaleros, this version is taken at a faster tempo and joyously ragged and raw. Cliff described the session with Gibson.com shortly before his induction to the Rock and Roll Hall of Fame this year. 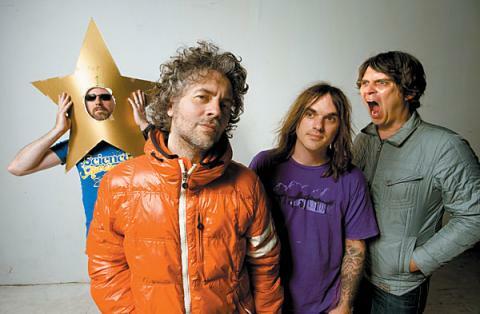 The Flaming Lips make every concert feel like a holiday, so it’s unsurprising several songs in their catalog have been inspired by Christmas – the biggest holiday of them all. “A Change At Christmas (Say it Isn’t So)” isn’t the Oklahoma City-based alternative rock band’s first tribute to Christmas. They had already brought “Christmas at the Zoo” and would soon deliver “Christmas on Mars.” But “A Change At Christmas” stands out, because it displays the “one love” hippie ethos at the heart of many of the band’s songs. In the song, Flaming Lips frontman Wayne Coyne wishes he could stop time so the whole world could permanently live in the goodwill of the season. A time, he says, “the world embraces peace and love and mercy/Instead of power and fear.” In the last verse he pleads “tell me I’m not just a dreamer,” echoing John Lennon, another Christmas idealist. 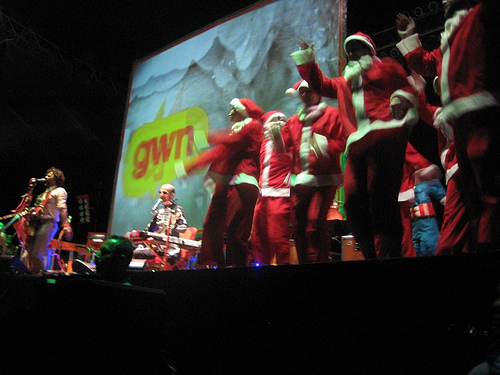 Above: Even Santa Claus gets down during a Flaming Lips concert. The arrangement features many of the Lips trademarks, including a sunny wash of synthesizers and toy drum machine. Sleigh bells and chimes bring a Yuletide feel, while a simple piano line holds the melody. While the Lips’ other Christmas songs saw release on proper albums or seasonal singles, “A Change At Christmas” was tucked into the “Ego Tripping” EP released in 2003. At the time of its release, the Lips were riding the success of “Yoshimi Battles the Pink Robots” with a deluge of singles, EPs and other releases. “A Change At Christmas” has become buried in the back catalog, but it’s a rare Christmas song that plays well year-round. It’s especially worth digging out in December. Before it was a song, “Happy Xmas (War Is Over)” was a billboard. In 1969, two years before the song was written and recorded, John Lennon and Yoko Ono proclaimed “War is Over! (If You Want It)” on signage in New York, Rome, Berlin, Tokyo and several other major cities around the world. The signs were an outgrowth of Lennon and Ono’s bed-in for peace, but the phrase stuck in Lennon’s head. When the couple relocated to New York City in 1971, Lennon quickly feel in the company of radical ‘60s activists Jerry Rubin and Abbie Hoffman. Lennon had already gone on record against the Vietnam War at a Beatles press conference in 1966. The conflict was also a frequent topic of conversation during the bed-in. Instead of giving peace a chance, though, the United States had become even more entrenched in combat. Inspired by his social circle and frustrated by another holiday season marked by fighting, Lennon turned his billboard slogan into a song. Lennon wrote the song over two nights in a New York City hotel room and recorded it almost immediately. Despite being released less than three weeks before Christmas, the single still managed to reach the Top 40. The feat was replicated each time the single was re-released. In Lennon’s native England, the single did not appear until 1972, when it went in the Top 5. The melody is based on the folk ballad “Stewball,” a song about a British race horse. The first versions of “Stewball” date to the 18th century, but Woody Guthrie and Lead Belly put their stamp on the song in the 1940s. During the folk revival of the early ‘60s, both Peter, Paul and Mary and Joan Baez included the song in their repertoire. Many artists, including skiffle singer Lonnie Donegan, a big influence on Lennon and most British musicians of his generation, have cover “Stewball,” but their numbers pale in comparison to the roster of those who have recorded “Happy Xmas (War Is Over).” From Andy Williams and Celine Dion to Maroon 5 and American Idol David Cook to the Moody Blues and the Polyphonic Spree, the song has been covered by nearly every conceivable artist in nearly every conceivable genre. Every great song usually inspires about a dozen covers. Most of these are pedestrian and instantly forgotten. The few that transcend the original can be troublesome for the original artist. Should they mimic the new, more popular version or maintain the original vision? Bob Dylan has turned his nightly performances of “All Along the Watchtower” into a sort-of tribute to Jimi Hendrix. Trent Reznor, however, continues to perform “Hurt” as he originally intended, ignoring Johnny Cash’s transcendent interpretation. Ray Davies wrote “You Really Got Me” in 1964 on an upright piano. The initial sketches suggest a loping bluesy number somewhere between Gerry Mulligan and Big Bill Broonzy, two of Davies’ biggest inspirations at the time. Davies’ brother Dave had different ideas. Latching onto the riff, and drawing on “Wild Thing” and “Tequilla,” he drove the song through his distorted guitar. The song was born anew, and when Ray Davies heard the new arrangement he knew that’s how his number was supposed to be played. Unfortunately, the Kinks had already taken the first arrangement into the studio. It was that version that Pye, their label, intended to release as the band’s third single. The Kinks and producer Shel Talmy successfully lobbied for another session to re-record the number with the newfound grit and rawness. The result was the band’s first No. 1 hit in their native England, thereby launching their career. Davies and the Kinks may have moved on, but the rest of the world was just catching up. “You Really Got Me” inspired the signature grimy riff of “Satisfaction,” the feel of “Wild Thing,” and all of “I Can’t Explain.” Heavily distorted guitars became a staple in the burgeoning psychedelic rock scene and, a decade later, the backbone of punk. 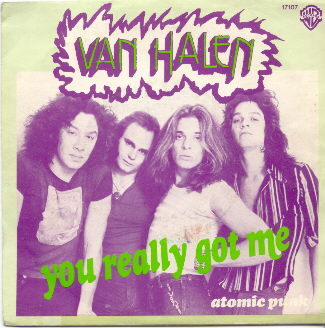 In the heart of punk movement, Los Angeles party band Van Halen decided to release their version of “You Really Got Me” as their debut single. Although the song only rose to No. 36 on the U.S. charts, it was tremendously popular, becoming a concert staple throughout the band’s career (and numerous line-ups). For the most part, Van Halen’s 1978 arrangement of “You Really Got Me” stayed true to the Kinks version. The biggest difference was Eddie Van Halen’s fretboard pyrotechnics. This transformed the song from a proto-punk jam into a guitar hero workout. Matching Van Halen’s instrumental energy was frontman David Lee Roth, whose grunting and moaning punctuated an already-strong come-on. In 1980, “You Really Got Me” was one of the last cuts on the Kinks live album “One From the Road.” The song had already been released in live format before, on 1968’s “Live At Kelvin Hall,” but this was the band’s first recorded response to Van Halen. I mention all this, because this month Ray Davies has elected to release another version of “You Really Got Me” on his new all-star duets album “See My Friends.” Since the Kinks have been on hiatus since 1996, Davies chose Metallica to back him on this track. Although they are working with the original songwriter, the grunts and asides spewing from Metallica singer James Hetfield make clear that his band is covering Van Halen, not the Kinks. Displaying a leaden stomp that makes Black Sabbath seem nimble, Metallica drain the life from the song as Davies stands helplessly by. 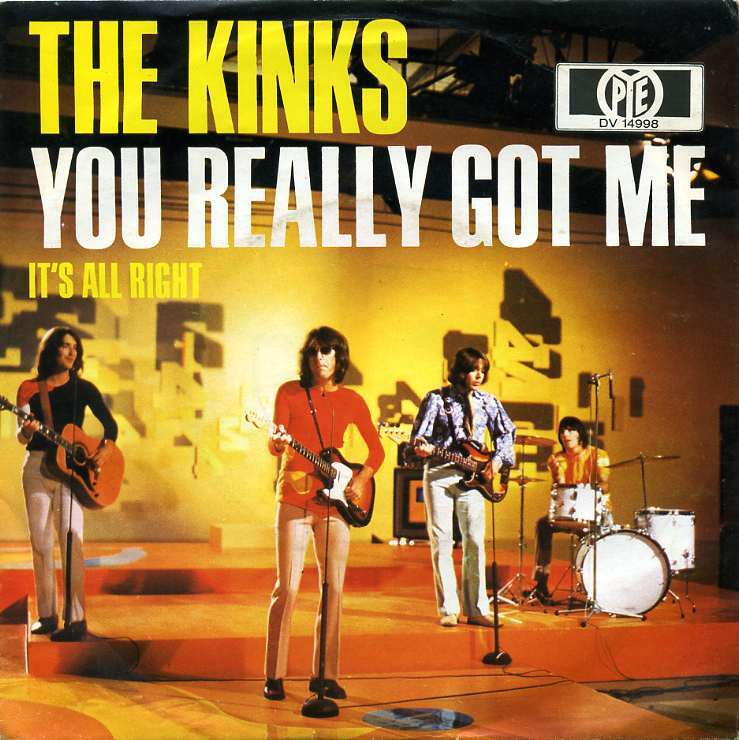 The Kinks original 1964 recording of “You Really Got Me” is a brilliant track. Van Halen’s cover some 14 years later also remains exhilarating (particularly when it is coupled with “Eruption,” the Eddie Van Halen instrumental that preceeds it on the album). Sadly, we have lost one version in the wake of the other.